Over the past few months I've been putting the Carvin Audio TRx3903 compact column loudspeaker system to work. Actually four of them, plus a pair of TRx3018A powered subwoofers, to be exact. Each TRx3903 vertical column houses nine 3-inch Faital Pro cone drivers in an enclosure that measures 31.5 x 5.25 x 5.5 inches (h x w x d) and weighs 21 pounds. Power ratings are stated as 180 watts continuous, 360 watts program and 720 watts peak, with the factory recommending an amplifier providing 200 to 400 watts of power. The 8-ohm loudspeaker’s sensitivity is listed as 100 dB, with a maximum SPL rating of 128 dB. Frequency response is noted as 160 Hz – 16 kHz (-3 dB), and dispersion is 120 degrees horizontal by 10 degrees vertical. The box is well constructed, utilizing 11-ply Baltic birch finished with a black Duratec weather-resistant coating (like a truck bed liner) and a rugged black powder-coated steel grill backed by foam. A white finish is also available. 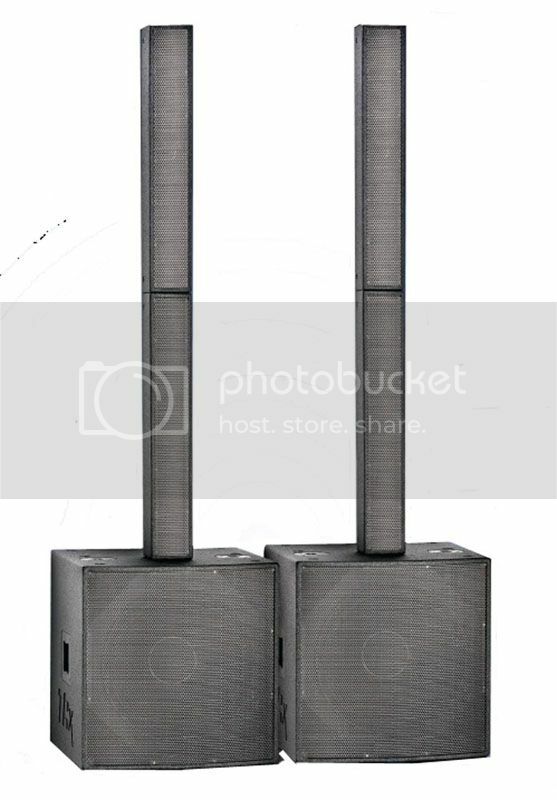 The cabinets have a pole-mount cup located on both top and bottom, and by using the SS7 short pole adapter (included), the units can be safely stacked atop one another as well as on the subwoofer. Eight flypoints (four on top and four on the bottom) are included for 3/8-16 eyebolts, and the optional 3903 UBK U-bracket can be utilized for additional mounting options. Connections include two 4-pin Speakon connectors on the rear of the enclosure, one near the top and the other near the bottom. They're positioned so that a short jumper can link two cabinets together. There's also a recessed switch that can change the pin settings from the normal pin 1+ and 1- setting to an alternate pin 2+ and 2- setting. The TRx3018A is a self-powered subwoofer that can also be ordered with an additional amplifier channel with DSP for the TRx3903 as well as other full-range loudspeaker models. The amplifiers supply up to 1,875 watts of power (RMS) to the sub and 625 watts (RMS) to loudspeakers. 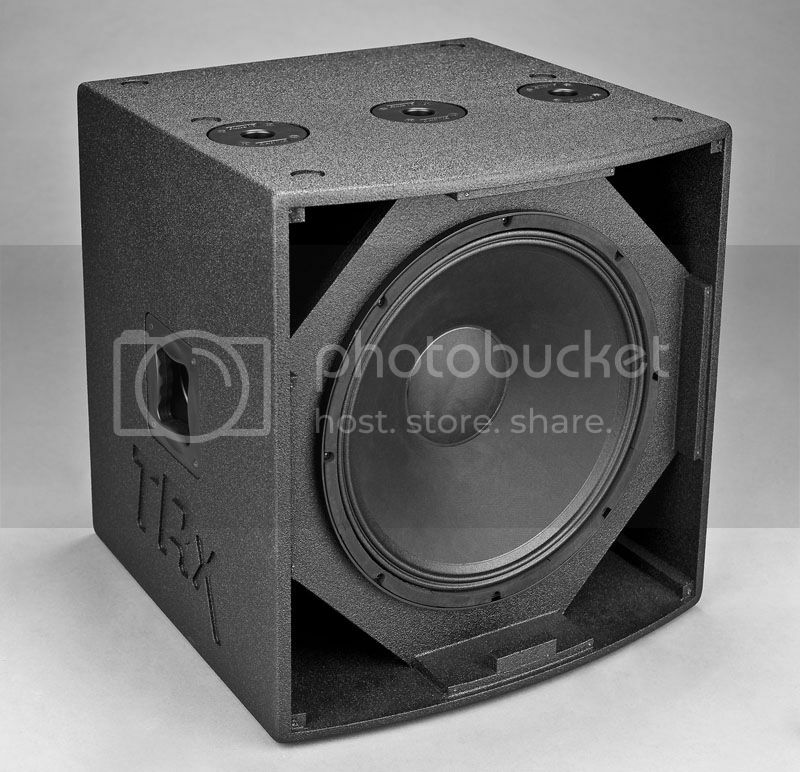 The sub is loaded with a single heavy-duty 18-inch woofer in a bass-reflex configuration with four corner located ports. Frequency response is stated as 38 Hz – 1 kHz (-3 dB). Built from 13-ply Baltic birch, the sub measures 23.5 x 23.5 x 23.5 inches (h x w x d) and weighs 75 pounds. There are three pole sockets on the top of the sub -- the center socket handles columns or any standard pole-mount loudspeaker, while the other two accommodate mounting (via poles) one or two Carvin TRx3210NF line array elements. In addition, “foot hole” recesses accommodate secure subwoofer and loudspeaker stacking without rigging. All of the sub's connections and controls are accessible via the rear panel, housed in a recessed module that includes power, signal, limit and protect lines as well as a 2-line display screen. Four buttons beneath the screen allow the user to scroll through the menu and select parameters and presets. Connect facilities include an XLR input and through jacks, USB connector, remote level Phoenix connector, satellite loudspeaker Speakon output, power switch, and locking IEC power cord input and output connectors. My company serves a lot of corporate gigs, where the majority of clients prefer smaller, less obtrusive PA cabinets. 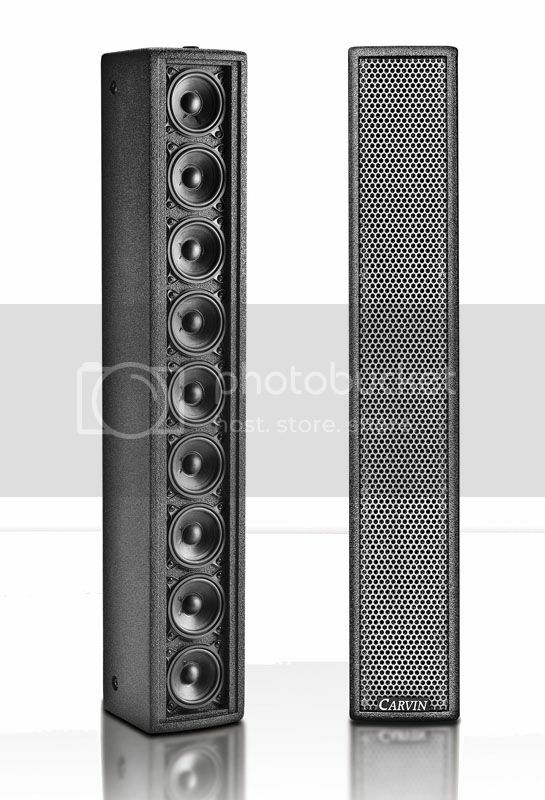 As a result, column loudspeakers have become one of my go-to tools, especially because today’s advanced designs have solved a lot of the problems encountered with past offerings. Back in the day, columns didn’t offer a very wide frequency range or handle a lot of power. That was fine when you were just reinforcing speech in a school theater or small church, but it wasn't so great for full-range music. All of that said, Carvin has set the bar high for modern columns with the TRx3903. It's easily one of the smallest models I've seen yet, while packing quite a punch and sounding great. I have to admit that when I first saw it at a trade show, I was a bit skeptical that a system using just 3-inch drivers would have enough output and fidelity to handle loud music. However, my concerns were erased when I had the opportunity to visit the Carvin factory in San Diego to hear the system first-hand. A few months later, the company sent me a system package. Note that while the components can be purchased individually, Carvin offers package options, including cables and poles, that arrive ready to handle gigs. In addition to the four TRx3903 columns and two TRx3018A subwoofers, my package included four SS7 short poles, two jumper Speakon cables, two longer Speakon cables, four locking IEC power cables and two soft-sided cases (very cool) that can each hold a pair of tops, the cables, and the SS7 adapters. It's all compact and can be easily transported by a single person. Setting up the system in the shop took just a few minutes. The subwoofer display is quite readable, with a menu that is easy to navigate. Presets are provided for several Carvin loudspeaker models, as well as for level controls and an extended bass setting for the subs when a little more "thump" is wanted. Initially I chose to leave the extended bass off and set about listening with my standard test tracks. It sounds really smooth, acoustic music in particular, and vocal clarity is fantastic. I suspect, at least in part, that this is because the loudspeakers are using cone drivers rather than compression drivers and horns, and there's also no crossover in the vocal region (or any crossover in the mid/highs, for that matter). The wide horizontal coverage pattern serves audience members located to the farther sides, and to my ears it sounded exactly the same as when located in front of the loudspeakers. This is most welcome in eliminating the need for additional fill boxes. The sub performs quite well, and when I did switch on the extended bass setting, it was useful in getting a bigger sound from just a single sub per side. Next I built a single stack using two TRx3903s and two TRx3018A subs and was quite impressed with the output. The tall stack puts the tops way up in the air and would work well for a mostly standing audience. Satisfied that everything was working properly, I took the rig out to a few gigs. The first show was a small meeting with presenters using podium and wireless microphones. Because of the TRx3903’s wide horizontal dispersion, I couldn't place the stacks next to the stage due to the proximity of the podium, which could have resulted in feedback. So instead, I located the stacks by the side walls and angled the tops inward toward the coverage area. This position resulted in excellent coverage and the rig did a great job with both speech and walk in/out music. The compact size and light weight made it easy to transport and set up by myself, so I saved a few bucks by not using an A2 on the gig. Next up was a DJ playing a corporate event who needed something beefier than his two 15-inch, horn-loaded boxes. When he first saw the rather miniscule size of the Carvin stacks, he looked more than a bit skeptical, but as soon as I cued up a dance track and sent it to the system, one might say his outlook changed considerably. In other words, watching his jaw drop almost to the floor made my night. Needless to say, the system met and exceeded his expectations, and it also made the event manager quite happy in terms of both performance and the small footprint. The final gig was for a live band at a huge wedding reception (party!) in an asymmetrical room. The stage, dance floor and about half the guest tables occupied the main area, with more guest tables and the dessert buffet and bar located off to the side where an air door had been opened. Normally I would have needed to deploy a third loudspeaker pointed at that side area, but the wide horizontal pattern of the TRx3903s had it covered. After the gig I spent some time answering questions from a very happy band who were intrigued with the performance of the system. Recently I was training a new audio tech at my company on our digital consoles, and set up the Carvin system as monitors. He was amazed with the amount of sound coming from those skinny cabinets. His response is typical of everyone who sees and hears the rig. You just don’t expect that much output from cabinets that are 5 inches wide. The Carvin TRx3903 and TRx3018A subwoofer combo is highly recommended for regional production companies, working musicians, and DJs. Particularly with the mounting options, it can also meet a lot of needs in the fixed install market, such as churches and educational facilities. Simply, it sounds great, gets loud, is really compact, and does all of that at an attractive price. I also appreciate that Carvin is a family-owned and run business. Just about everything the company offers is designed, produced, assembled and tested in its California factory. To me that's icing on the cake. I don't have many specifics, except the performances for the first season will be under a tent and then moved into a building the following season. I know that's a pretty general description, but it's all I have. I do know guests will be seated, all at ground level. The tent setting kind of precludes the use of a lift, because I doubt the height will be much more than 16' at most. The shows will have a chuckwagon theme, with guests eating first and then the show afterwards, so, it's not like they need to generate concert sound levels, and they don't want to blast the front several rows too much. I was just wondering if you think the TR400 or TR600 systems would be suitable in this situation. The system would be moved indoors after the first season to a "similar sized" room. The dimensions they gave me are about 200'x300'. My thought were that, if these systems are all they claim, to place the towers quite a ways in front of the stage because of the wide dispersion, and use front-fills to cover those seated closer to the stage. I don't know if there would be some kind of phase problem where the coverage would overlap. Let me know what you and everyone else think. A local DJ is thinking of these. Its been awhile. How are these holding up and do you still feel the same way about them?